I am having trouble deciding on a sock pattern to try. 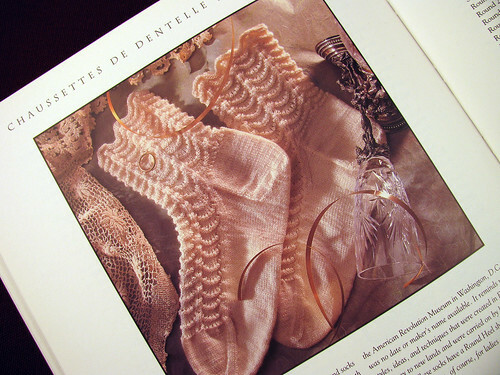 This one in Nancy Bush’s 1994 book “Folk Socks” looks like it would work really nicely in a self striping yarn. The gauge is wrong though and I would have to redo the number of stitches in each repeat. Then I would have to see if it would fit over a heel while trying to knit two socks at one time. I am worried the “Sock Innovation” patterns won’t look good in the wide stripes. Am I over-thinking this? This entry was posted on Saturday, April 11th, 2009 at 3:00 am and is filed under Knitting. Tagged: Knitting. You can feed this entry. You can leave a response, or trackback from your own site. Very pretty! Now, that’s the kind of sock I would love to knit…if I knitted, that is, LOL!